renal tsar's blog: What is self management support? The actions individuals and carers take for themselves, their children, their families and others to stay fit and maintain good physical and mental health: meet social and psychological needs; prevent illness or accidents; care for minor ailments and long-term conditions; and maintain health and well being after an acute illness or discharge from hospital. The above definition is from the Department of Health document ‘Self-care - a real choice (2005)’ but there are many others which sound pretty similar. Supporting self-management means providing information and encouragement to help people maintain greater control by understanding their condition and being able to monitor and take appropriate action. Interventions to support self-managing can be used at different points of the health continuum, from those who do not have a long term condition through to those who are living with severe and multiple long term conditions. 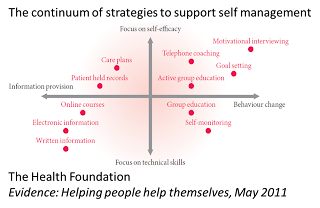 The better question is does self-management support work? The Health Foundation have reviewed more than 550 pieces of high quality research suggesting that it is worthwhile to support self-management, in particular through focussing on behaviour change and support in self efficacy. Hundreds of systematic reviews, randomised control trials and large observation studies have examined the impact of supporting self-management for people with long term conditions. Whilst there are few in kidney disease and the findings of individual studies are mixed, the totality of evidence suggests the support in self-management can have benefits for peoples’ attitudes and behaviours, quality of life, clinical symptoms and use of health care resources. Full details of the Health Foundation review can be found in “The Health Foundation: Evidence: helping people help themselves, May 2011"
Kidney disease is a silent killer. Unlike many other long term conditions such as diabetes, asthma or rheumatoid arthritis there are few if any symptoms in the early stages and therefore the techniques to support self-care for people with kidney disease might be more akin to those that are successful in hypertension and hyperlipidaemia than those of proven benefit in conditions where immediate relief of symptoms might be expected. It is important to plug this kidney research gap but in the meantime the overall evidence is clear that self-care has a large part to play in the management of chronic diseases.